Tumpeng is a way of serving rice and its side dishes in a cone form. Tumpeng is generally used in the form of yellow rice, although often also used ordinary white rice or nasi uduk made by using a cone-shaped woven bamboo container. The way of serving this rice is typical of Java or Betawi people of Javanese descent. Traditionally featured in the slamatan ceremony and is usually made at the time of festivity or celebration of an important event. In general, the Indonesian people are familiar with this activity. Tumpeng is usually served on tampah or winnow (a traditional round container of woven bamboo) and a banana leaf. Communities on the island of Java, Bali and Madura have a habit of making tumpeng for celebrating an important event, such as birth or birthday celebrations and other celebration events. Today, almost all the people of Indonesia familiar with tumpeng. Tumpeng philosophy is closely related to the geographical conditions of Indonesia, especially the island of Java, which is filled with of volcanoes. Tumpeng comes from ancient Indonesian society that glorifies the mountain as a place of dwelling the hyang, or ancestral spirits (ancestors). After the Javanese people were embraced and influenced by the Hindu culture, the cone-shaped rice was meant to mimic the holy mountain form of Mahameru, the place of which dwells the gods. In the beginning, tumpeng was used by Javanese and its surrounding communities (including Madurese and Balinese), to make offerings to the mountains as a form of tribute that there were ancestors inhabiting the mountains. This happened long ago, long before religion entered the archipelago. Later, Hinduism entered Indonesia. Celebration and making of cone have little change, that is from the form of rice. 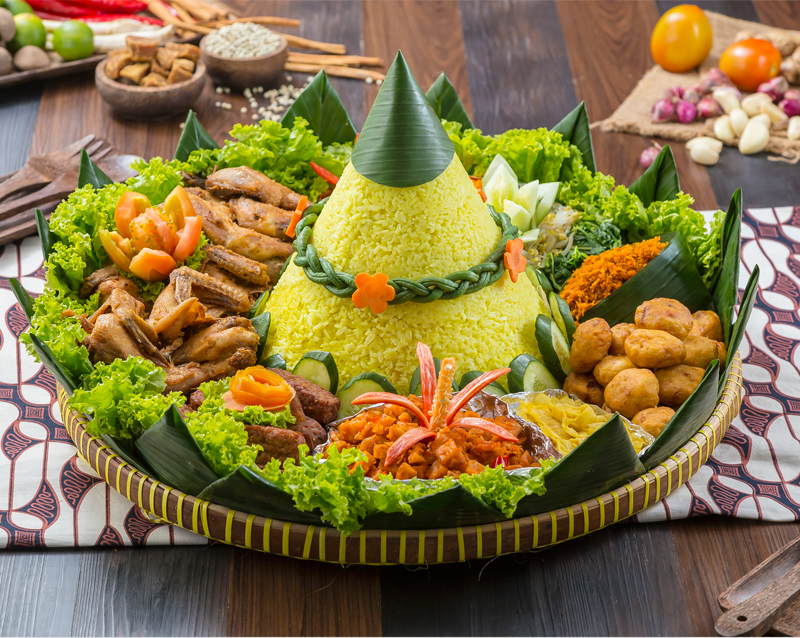 The new tumpeng rice began to be cone-shaped when the Hindu era. The cone is an imitation of the Mahameru mountain form as a place of residence of their gods. Although the tradition of cone has existed long before the introduction of Islam to the island of Java, the tumpeng tradition in its development was adopted and associated with the Javanese Islamic philosophy, and was regarded as the ancestral message regarding the supplication to the Almighty. In the tradition of kenduri Slametan in traditional Javanese Islamic society, tumpeng served with previously held Qur'an recitation. According to Javanese Islamic tradition, "Tumpeng" is an acronym in Javanese: yen metu kudu sing mempeng (if out must be in earnest). There is one more food unit called "Buceng", made from sticky rice; acronym from: yen mlebu kudu sing kenceng (when entering must be earnestly). The tumpeng dishes, amounting to 7 kinds, the number 7 in Javanese is pitu, meaning Pitulungan (help). The three sentences of the acronym, derived from a prayer in surah al-Isra 'verse 80: "O Lord, please input me in truth and get me out completely and make yours power for me who gives help". According to some commentators, this prayer is read by Prophet Muhammad SAW time will emigrate from the city of Mecca to the city of Medina. So if someone is to celebrate the presentation of Tumpeng, the purpose is to ask for help to the Creator so that we can get good and avoid the evil, and get the glory that gives the help. And that's all we will get if we want to try earnestly. Tumpeng is an important part in celebration of traditional festivity. Celebration or feast is a form of gratitude and gratitude to the Almighty over the abundance of other crops and blessings. Because it has a value of gratitude and celebration, until now tumpeng often serves as a birthday cake in celebration of a birthday party. In celebration, thanksgiving, or slametan, after the recitation of prayer, unwritten tradition suggests tumpeng tops are cut and given to the most important, the most honorable, the most honored, or the most elderly among the people present. This is meant to show respect for that person. Then everyone present was invited to enjoy the tumpeng together. With tumpeng community showing gratitude and gratitude to God as well as celebrating togetherness and harmony. The event involving rice cone is referred to as 'tumpengan' as layman. In Yogyakarta for example, the tradition of 'tumpengan' developed on the night before August 17, Proclamation of Independence Day of Indonesia, to pray for the salvation of the state. There are no standard dishes to accompany rice cone. However, some of the usual side dishes are cakes, shredded beef, fried eggs, fried eggs, cropped cuts, and celery leaves. The variations involve dry tempe, serundeng, long bean omelette, salted fish or fried catfish, and so on. In terms of the traditional meaning of tumpeng, it is recommended that the side dishes used consist of land animals (chicken or cow), marine animals (catfish, milkfish or rempeyek teri) and vegetables (kale, spinach or long beans). Each of these side dishes has a traditional meaning in Javanese and Balinese culture. Tumpeng makeup competition is quite common, especially in cities in Central Java and Yogyakarta, to enliven the Day of Proclamation of Independence. In addition around the rice cone usually there are side dishes. Well, the selection of the number and types of side dishes in the rice cone rice is also not arbitrary, lo! Because everything has its own meaning. Usually there are at least 7 types of side dishes on rice cone. Why 7? For in Java the number 7 is called pitu, which can also be interpreted as pitulungan or pembolongan. In addition, the types of side dishes that are selected also have meaning. Eg eggs that describe togetherness. Maybe friends also often find various types of fish in a cone of rice cone? Well, this fish describes a tenacity, and the struggle of life despite being in difficult times. There is also a rooster that is usually cooked with yellow spice. This symbolizes that humans should avoid the ugly nature of the rooster (male) eg arrogant or want to win alone. Unlike the side dishes that have many meanings, vegetables in the rice cone rice cone generally has a good meaning. Vegetables consisting of kale, toge, and long beans have a meaning to protect and good judgment in choosing everything. There is a philosophical meaning on every part of traditional tumpeng. According to folklore in Java and Bali, the cone-shaped tumpeng is a mystic symbol of life and ecosystems. It also symbolizes the glory of God as the Creator of nature, and the side dishes and vegetables represent the life and harmony of nature. The authentic and complete tumpeng dishes should contain at least one meat to represent a land animal, fish to represent sea creatures, an egg to represent winged beasts, and vegetables that represent a food stock provided by the plant kingdom. Usually tumpeng is served with spinach as spinach is a traditional symbol of prosperity in Javanese agricultural society. Vegetables: A wrap of vegetables represents a good relationship with friends and neighbors. Spinach represents a safe and peaceful life; water spinach represents a person who could live through hardships; string beans represent a long life; and mungbean sprouts represent having ancestors to carry on a legacy. Today, most Indonesians serve tumpeng as a dish to celebrate a special occasion, such as a birthday party, arisan, family or neighborhood gathering, farewell party, celebrations, recitals, and many other joyous events. Because of its festive and celebration value, up until now tumpeng sometimes seen as an Indonesian counterpart of birthday cake. Tumpeng contests are sometimes held to commemorate Indonesian Independence day in August 17 or to commemorate women's emancipation day, the Kartini in April 21. The tumpengs in this contest are judged by decoration and taste.